The Accidental Locavore reluctantly turned down my invitation to attend this weekend’s Pig Island festivities. This shocking lack of priorities did not go unnoticed by the nation’s food bloggers; they have her in a secure location and she is currently being reprogrammed. She’ll be back with you soon, but until then, you have Zhu Zhu, which is Chinese for “Piggy Piggy” and thanks for asking! 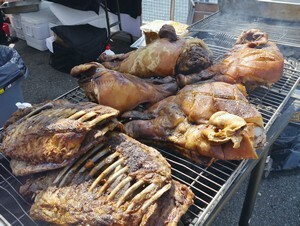 and a 30 minute wait in line will leave you in hog-heaven with 80 locally-sourced pigs and 30 chefs. seasoned pros who sailed straight through. I’m never able to resist pork-saturated carbs, so I steered a middle course. A short nap on the grassy knoll helped me make it to the end. 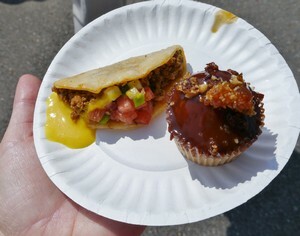 Butter (love the name): served the most amazing chorizo tacos, seasoned with watermelon and serrano chile sauce. There was also fantastic banana bread with pralines topped with candied bacon. Joe & Misses Doe: really great sliders, mouth-wateringly tender and perfectly flavored pork. 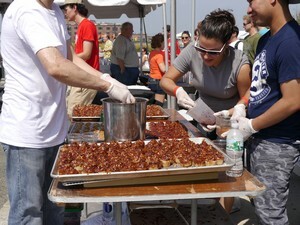 Randall’s Barbecue: more sliders, with definitely the best barbecue sauce at the event. Waterfront Ale House: head cheese and garnishes on black bread. Really great. I tried, but failed, to eat a million of these. Neuman’s Kitchen: Roasted pig, caramelized corn, bacon, pig’s ears and razor clams. Awesomely delicious and a nice change from the endless sliders. the bowl’ and I managed to get two complete spoonfuls. Wow! removing the ear each time. I will definitely be giving them another chance. The Merpig, perhaps because it was so greatly hyped, was a disappointment. This is an entire hog, wrapped in seaweed and pit-roasted. It was good, but not as amazing as it sounded. Tavern on the Green’s dishes get marks for creativity, but not for flavor. Pork belly on ramen noodles and candied pork belly with garnishes. Disappointing. Pork belly needs no help. If you add something, it needs to be an improvement, guys. Revolving Dansk wants to bring Danish street food (basically a hot dog) to America. Good luck on that. The “Polser” poses no threat to any hotdog truck in NYC. They also served a crackling pork and Scandinavian pickles on a toasted baguette​. That was modestly better. Egg produced the only thing I couldn’t eat. An inedible piece of pork presented on a completely raw piece of dough. It was disgusting. Pig Island is already on my calendar for next year. Previous post: Maison Kayser Revisited, or a Great Lunch!